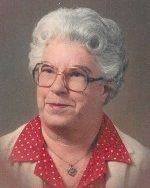 Pauline Augusta Kessler, nee VanLongstratt, 96, of Swansea, IL, born January 5, 1923, in St. Louis, MO, died Friday, April 5, 2019, in Swansea, IL. Mrs. Kessler was a member of the Christ United Church of Christ. She belonged to the Southside Improvement Association and to the Illinois Nut Growers Association. She was preceded in death by her husband of 61 years, Kenneth J. Kessler, whom she married on July 24, 1948, and who died on October 19, 2009; her parents, Henry and Selena, nee Snowert, VanLongstratt; two sisters, Emma Ruckenbrod and Clara Siemons; and one brother, Julius Stoen. and three great-grandchildren, Kaid Eakins, and Katelyn and Dylan Spencer. Memorials may be made to Christ United Church of Christ, Belleville, IL. Condolences may be expressed to the family online at www.rennerfh.com. Visitation: Friends may visit from 9 to 11 a.m. Saturday, April 13, 2019, at George Renner & Sons Funeral Home, Belleville, IL. Funeral: Funeral services will be at 11 a.m. Saturday, April 13, 2019, at George Renner & Sons Funeral Home, Belleville, IL. Private burial will be at Jefferson Barracks National Cemetery, St. Louis, MO. Sharon so sorry to hear of your Mom's passing please accept my sympathy.